This colorful chirimen item includes fish from the Uwakai Sea, nozawana, and white sesame seeds. Simply defrost in the refrigerator to use. The term chirimen can refer to several different kinds of tiny dried fish species. In this case the fish used are Japanese anchovies. Though a package of chirimen may look strange if you have never seen one before, these little fish are quite delicious and are very popular in Japan as an ingredient or topping for a variety of foods. Sugarlady’s seafood is caught in season and processed right away, ensuring that you always receive the highest possible freshness and flavor. In addition, because the fish comes frozen, it is easy to have plenty of foods like chirimen (which can be difficult to find in some countries) on hand at any time without worrying about it spoiling or growing stale. Sugarlady’s seafood and other frozen products allow you to eat meals and snacks containing all sorts of real, nutritious ingredients whenever you desire, even on the busiest of days! Defrost this item in the refrigerator. 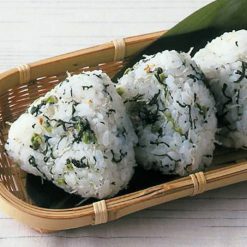 It can then be eaten as-is or used in onigiri, furikake, ochazuke, chahan, or other foods.Onigiri are rice balls, often eaten for a quick meal on the go or as a snack. The chirimen may be mixed into the rice of the onigiri, or used as the onigiri’s center. 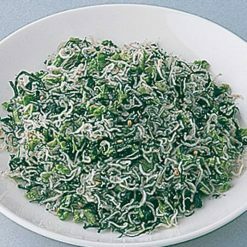 Furikake is a broad term that refers to dried seasonings sprinkled atop rice, noodles, or other foods. 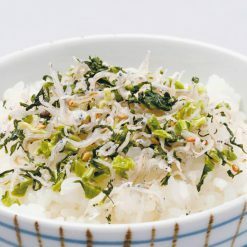 Ochazuke is rice with tea or broth poured on top, garnished with chirimen or other toppings. Chahan is Chinese-style fried rice. This product contains chirimen jako (Japanese anchovies/Ehime Prefecture Uwakai Sea, table salt), pickled nozawana (nozawana, table salt), white sesame seeds.. This product is not suitable for anyone with allergies to sesame or contamination. Origin of ingredients: Japanese anchovies/nozawana (domestic). Prepared and packaged in Japan.